In the buildup to the Spanish Grand Prix, we went for a track walk on the most famous Spanish circuit of all time. Montjuïc Park in Barcelona. Since 1991 the Spanish Grand Prix has found its home at the Circuit de Catalunya on the outskirts of Barcelona. The track’s construction coincided with that of the Olympic park used for Barcelona’s 1992 Summer Olympics. The Olympic park was ironically built on the location of the most daunting and challenging grand prix circuits in history, the circuit of Montjuïc. Located on a picturesque mountain just outside the city’s centre, the street circuit featured a technical first half with plenty of camber and elevation changes and a blindingly quick second part, sweeping around some of Barcelona’s finest parks. In the ’30s Montjuïc park hosted the so-called Penya Rhin Grand Prix, with the likes of Tazio Nuvolari and Luigi Fagnoli taking wins for Alfa Romeo and Mercedes-Benz respectively. The circuit was revived in the ’60s to host the Spanish Grand Prix Formula 1 alongside Jarama. The track was praised for its beautiful layout and surroundings, yet notorious because of its inherent danger. The entire 3.7 kilometre circuit was lined with trees and buildings, while there wasn’t much in the way of safety features. Concerns proved to be justified as the 1975 race was cut short by a tragic accident involving the race’s leader Rolf Stommelen. At high speed the rear wing of Stommelen’s Embassy-Hill – Lola broke off, catapulting the car over the poorly constructed barriers. Two spectators, a photographer and a fireman did not survive the crash. Following the accident, Formula 1 would not return to Montjuïc. 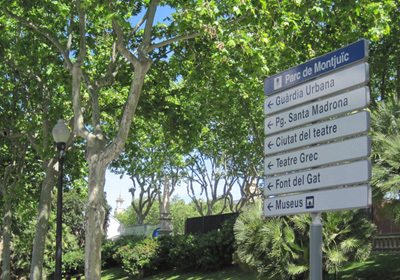 Today the Olympic legacy of the park is still omnipresent and promoted the mountain to one of the greatest features of Barcelona. The old layout is still used as some of the park’s main roads.